Choose your own adventure on a self-guided tour of Norway, from Oslo to Bergen. All transportation is included for your excursion through some of the country's most beautiful alpine scenery. Scenic rail journeys on the Flåm Railway and Bergen Railway, as well as a cruise through the Aurlandsfjord and Nærøyfjord. Begin your comprehensive self-guided tour of Norway from the Oslo Train Station. When booking, provide your hotel details, and your package of transportation tickets will be dropped off at your hotel. Departure times vary depending on the time of year. Climb aboard the Bergen Railway and travel west to Myrdal, where you'll disembark and change to the Flåm Railway. Keep your camera handy for sweeping views of Norway's wilderness and the fjords. Transfer to a boat for a fjord cruise on the Aurlandsfjord and Nærøyfjord. Both offer terrific views, and the Nærøyfjord is one of Europe's narrowest, included on the UNESCO World Heritage list. Step off your cruise in Gudvangen, where you'll climb aboard a bus for a trip through Nærøydalen's mountain scenery and quaint villages. Seasonally (summer), the bus will take on the steep and winding Stalheimskleiva to Voss, where you'll take the Bergen Railway back to Bergen. This tour is entirely self-guided, and you can move at your own pace. WOW! This was an amazing trip! I wish the itinerary was a bit clearer but other then that, its was so worth it!!! We really enjoyed the self guided tour. Step by step instructions were provided on email prior to arriving in Norway. I had some questions the night before and the local guide was very accommodating and went over everything with me by phone. Highly recommend this self-guided tour for people who like to manage on their own. 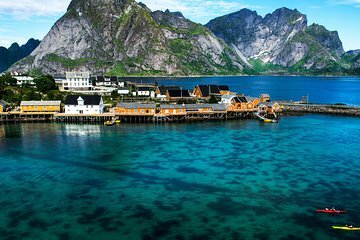 GREAT WAY TO SEE NORWAY IF YOU HAVE A LIMITED AMOUNT OF TIME. THE TRIP FROM GEILO TO MYRDAL WAS THE BEST. I SAT ON THE SOUTH SIDE OF THE TRAIN WHICH AFFORDED THE BEST VIEW THE LAST PART OF THE TRIP. WATERFALL FROM MYRDAL TO FLAN IS NOT TO BE MISSED. The local tour guide in Oslo, Ivan did a great job! he did what he said he would and was responsive to my email questions. It is a LONG day and we are fit, so once you get to Bergen, if you can, stay the night. Lots of nice hotels close enough to walk from the train station or take the tram to the end of the line, which saves you a few blocks of toting bags. There are a number of 'fjords' that the tour outfits go through and this one is nice not the one that they write about in the tour book, Sognefjord, but great nonetheless. Take this self-guided Oslo to Bergen tour if you need to get from Oslo to Bergen within a day. Ivan and Artus were excellent in arranging the tour and going out of their way to provide top-class service. Well done Ivan and Artus!! If the tour allows, would recommend staying overnight at Flam before continuing to Bergen the following morning for a more leisurely journey. If staying over at Flam, a must see side trip is Stegastein Viewpoint, a half hour bus ride from Flam. GREAT. ENJOYED EVERY MINUTE OF THIS TRIP. The Norway in a Nutshell trip is a delight, not to be missed, but buying these through Viator is not wise. Tickets must still be picked up at the vendor's at the train station, and their hours are limited, especially on weekends. A better approach is to buy the tickets in person previous to the day you plan to take the trip.